Private equity and strategic investors continue to demand loans with "certain funds" or "SunGard" limited conditionality to finance their M&A activity in Latin America. Having survived many geopolitical challenges in 2018, the M&A market in Latin America should improve in 2019 from greater political stability, accompanied by other local trends that suggest increased opportunities for investors and lenders financing M&A activity in the region. For 2019, the International Monetary Fund is forecasting that the GDP in Latin America and the Caribbean will grow by 2.2%, with country-specific variations (Argentina: a decrease of 1.6%; Brazil: an increase of 2.4%; Chile: an increase of 3.4%; Colombia: an increase of 3.6%; Mexico: an increase of 2.5%; and Peru: an increase of 4.1%).5 The Intralinks Deal Flow Predictor report predicts that through Q1 2019, Argentina is expected to show the highest increase in M&A announcements among the largest Latin American economies, whereas levels of M&A announcements are expected to be flat to declining in Brazil, Chile, Colombia, Mexico and Peru. 1 We would like to thank the following individuals for their contributions regarding the country-specific legal and market discussions included in this article: with respect to the discussion of Argentine legal and market matters, Juan M. Diehl Moreno, Partner, Marval, O'Farrell & Mairal; with respect to the discussion of Brazilian legal and market matters, Leonardo Baptista Rodrigues Cruz, Partner, Pinheiro Neto Advogados; and with additional input on Brazilian market matters from John Anderson, Partner, White & Case LLP; with respect to the discussion of Chilean legal and market matters, Diego Peralta, Partner, Carey y Cía. Ltda. ; with respect to the discussion of Colombian legal and market matters, Juan Fernando Gaviria, Partner, Philippi Prietocarrizosa Ferrero DU & Uría – Bogotá; with respect to the discussion of Mexican legal and market matters, Juan Antonio Martin, Partner, White & Case LLP; with respect to the discussion of Mexican tax matters, Guillermo Aguayo-Garza, Local Partner, White & Case LLP; with respect to the discussion of Peruvian legal and market matters, Carlos Saco-Vertiz Tudela, Partner, BBGS Saco-Vertiz & Landerer Abogados; and with respect to the discussion of Peruvian tax matters, Jaime Sabat Pancorvo, Senior Associate, BBGS Saco-Vertiz & Landerer Abogados. 2 Mergermarket, Global and Regional M&A Report 2018 (2018). 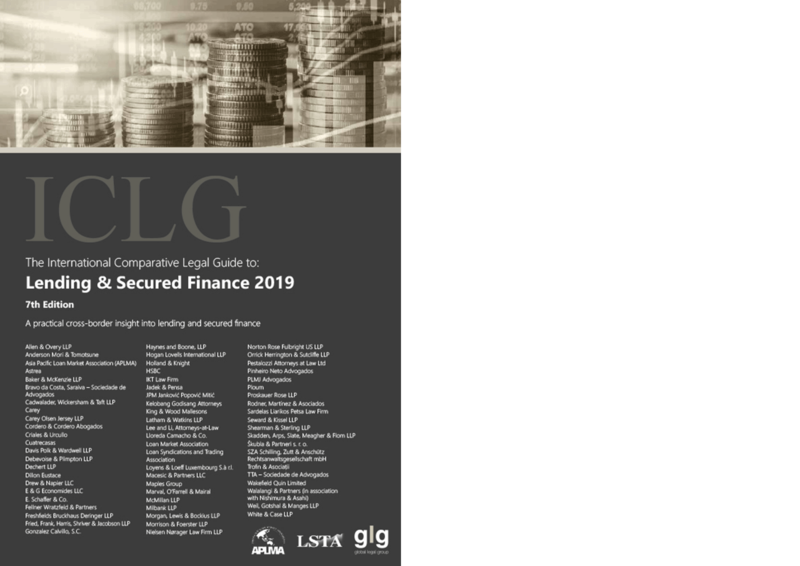 Reproduced with permission from International Comparative Legal Guide to: Lending & Secured Finance 2019, Global Legal Group Ltd, London.